This church is located at a distance from the red line of Nevsky Prospect, in the interior of the area between houses 22 and 24. Between 1710 and 1728 the first Lutheran church in St Petersburg was placed in the house of vice-admiral K. Kryuise on the bank of the Neva River. In 1719 the church was moved to the corner of the Moyka River and Nevsky Prospect. In December 1727 it was given a permission to erect a new building of the church on Nevsky Prospect. The church was built between 1727 and 1728. But at the beginning of 1832 the German Lutheran Community announced a competition for a new design of the church building. Five projects were submitted to the committee. The author of the best design was the architect Alexander Bryullov. Alexander Bryullov was the brother of the famous artist Karl Bryullov. The building of the church was constructed between 1833 and 1838. The interior of the temple was rebuilt abso­lutely, but the façades were preserved. The architect added the features of the Roman style to the appear­ance of the building. The building has two-tower façade. The portal of the front elevation has a large arch in the centre of the build­ing. There is an open arcade loggia over the arch on the second floor. The two three-level towers are located at the sides. The façade is embellished with a sculptured bas-relief depicting evangelists. It was created by two sculptors Alexander Triscorni and Theodor Jacques. The interior of the church was masterly executed by the architect Alexander Bryullov. The design of the huge church hall was imbued with the spirit of the Roman­esque architecture. The high vault rested on granite pil­lars and columns and amazed by its excellent paintings. The picture “The Crucifixion” by the brush of Karl Bryul­lov was one of the best decorations of the hall. On the 2nd of March 1938 the church was closed. The building was given to the concert hall. In 1958 the church was transformed into a swimming pool. The interior of the church was replanned and reconstructed. The paint­ing decorations were damaged. The magnificent organ was ruined. Nothing was left. 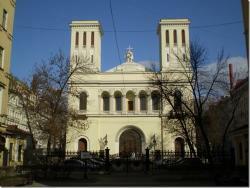 At the end of the 20th century the Lutheran Church of St Peter and Paul was restored and returned to the belivers. Now the services are held in the church.